Image credit: Modern Language Association. MLA core elements. 2016, www.mla.org/MLA-Style/What-s-New-in-the-Eighth-Edition. Never include a document in a reference list that you have not seen. Square brackets are used to identify material that is not found in a document, but that has been added by you. Works Cited entries are made up of core elements. To create your Works Cited reference citation, move down this table from Author to Location, inputting the relevant information into your citation. Some core elements will not be necessary or available for some sources. Include the core elements you have, need, and are relevant to your use of the source. Optional elements may be added. Visit the optional elements page for more information. Some sources are part of one or two containers and will require the repetition of some core elements for each container. Add the elements to your reference entry from Author through to Location, then add any second elements in that same order. 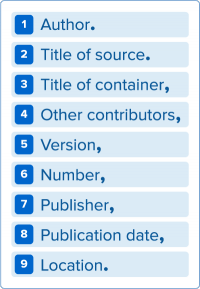 For example, online articles from databases have two containers: the first is the journal in which the article is contained and the second is the database in which the journal is contained. The same article could also have two locations: the first is the page number and the second is the Digital Object Identifier (doi). 1. Author. Author(s) and/or editor(s). Author of essay or chapter. Author(s). Author(s) and/or editor(s). 2. Title of source. Book Title: And Subtitle if Included. "Title of Essay or Chapter." "Article Title: And Subtitle if Included." "Web Page or Article Title." 9. Location. Page number (p.) or page range (pp.). Page number (p.) or page range (pp.). Page number (p.) or page range (pp.). URL. 9. Second location. URL ("http://" or "https://" omitted) or DOI (doi:xxxxxxxxxx).